7 tents you don't see often when camping. We have a lot of tents. They are used in different climates and situations. We choose our tent based on where we are camping and how we are getting there (a family tent isn't one we want to carry on a hike). But the selection of tents compiled below are tents that we do NOT own – probably not likely too any time soon either. But they do look interesting and a bit of fun. Which tent would you like to try out? _ Dutch designer and sculptor Dré Wapenaar designed these tents that look like dewdrops. Made of steel, wrapped in canvas, they are definitely eye-catching. How practical they are for everyday camping situations, I am not so sure. 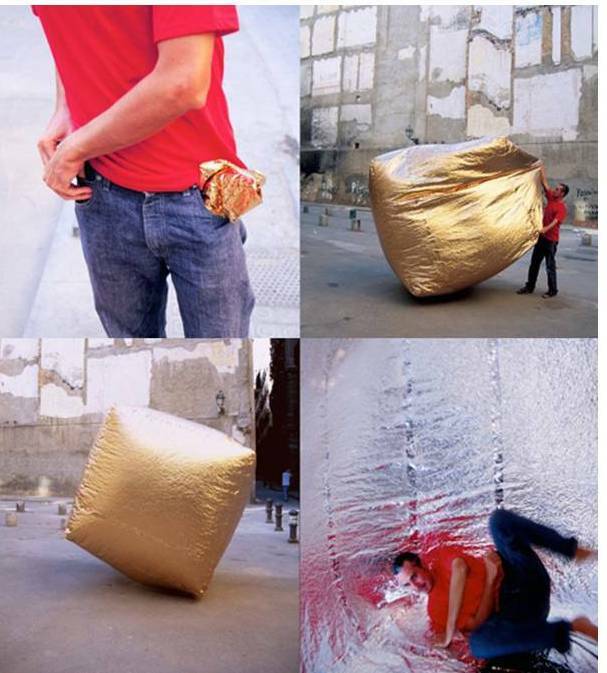 Ever wanted to carry your tent in your pocket? No? Me neither. But just in case you are such a person, then there is a tent for you. Designed by Martin Azura this tent is sure to impress fellow campers you pass on a busy city street. Going for a hike in wet weather? 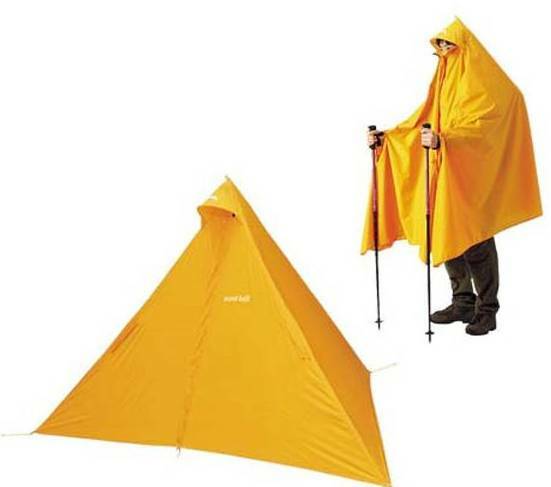 Then you just might need this poncho/tent. Wear it to keep dry and should your hike get extended, you have your shelter as well. No need to carry an extra tent in your pack! Apparently you just need to stake it out, which would mean taking it off.....Just not sure if this concept will catch on. This tent is fully inflatable – unroll it, get out your pump (make sure you pack it) and you are ready to go. There was another video on the site (heimplanet.com) which is very arty but never really shows you the tent being put up outdoors. Just a lot of pensive looking people doing cool things and attending concerts. The video says its sleeps 3, but 6 people can sit in it – you don’t actually see anyone doing that because they are all too busy being rugged or it looking at lots of waves in the ocean – presumably so we know that we can use it as a boat? See it at heimplanet.com (few spelling mistakes in it too which I find a tad annoying in an ad). Below is someone actually putting up the tent and looking a bit sheepish about the whole pumping action required. The Cave - Setup from heimplanet on Vimeo. Love the movie? Now you can sleep in a clownfish! This one cool looking tent. My children would love it, and you would certainly stand out at any campsite. I'ts called the Isopod, and made for extreme conditions. It looks great, and seems to have all the specifications you would need for cold weather environments. 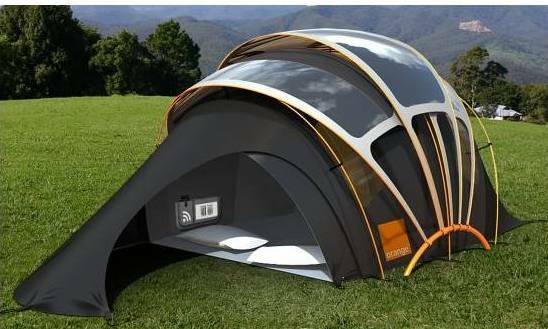 Another good looking tent, this one known as the Orange Solar Concept Tent (created along with US company Kaleidoscope) and it allow campers to power their essential camping gadgets plus keep in touch with others. From the website it says ‘this model gets photovoltaic fabric in three “glides” that move throughout the day to capture the sun’s energy and use it to various techie ends”. It comes with touchscreen display that provides Wi-Fi, as offering a wireless charging pouch . At a campground, and can’t find your tent? No problems. Send your TENT a text, and it will glow. Designed for those who can't leave technology behind - even for camping. This is a very communal option for a tent- each of you in your own little wigwam like structure, and then if you want to go and visit each other, no need to get outside the tent and get cold. Just crawl through the tunnels. Depending on your tent, you could have 4 tunnels or more leading off the tent. I think the children would love crawling through each section, paying late night visitors to all the others at end of each tunnel. The adults, I am not that sure about.